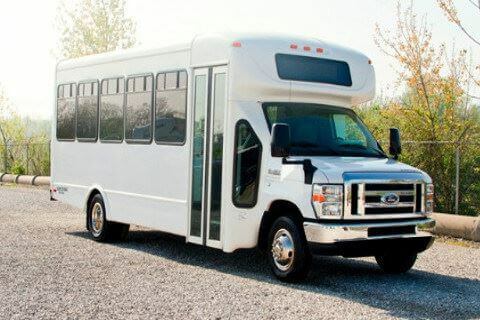 Compare pricing for Florida charter buses, shuttle buses, minibuses and more from all across the state! Price4Limo has over 12,000 vehicles in our inventory across the USA with photos and prices for you to choose for your transportation needs. Getting a free quote takes less than 30 seconds and no email is required! Looking to get away to the best warm and sunny beaches in the country? Florida boasts some of the best beaches along with world famous theme parks like Disneyworld and Universal Studios. Other fantastic tourist destinations await you here as well like world class golf courses, boating tours and more. Florida is well known for their sports teams as well like the Miami Heat, the Miami Dolphins, Jacksonville Jaguars and many more across different sports leagues. The state is rich in history as well with destinations like St. Augustine, Florida's oldest settlement. Many of the cities in Florida have much to offer no matter where you go. Fort Lauderdale is famous for it's canals and downtown nightlife. Miami is rich in culture and offers a unique Latin-infused experience found nowhere else in the country. Orlando is home to multiple theme parks and tourist attractions that bring in people for all over the world. Wherever you want to go in Florida you're sure to find something fantastic. 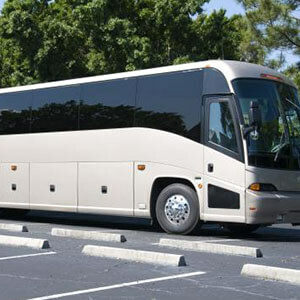 If you and a large group of people are coming to visit Florida for a school trip, corporate outing or other special event then a charter bus rental from Price4Limo is the way to go. 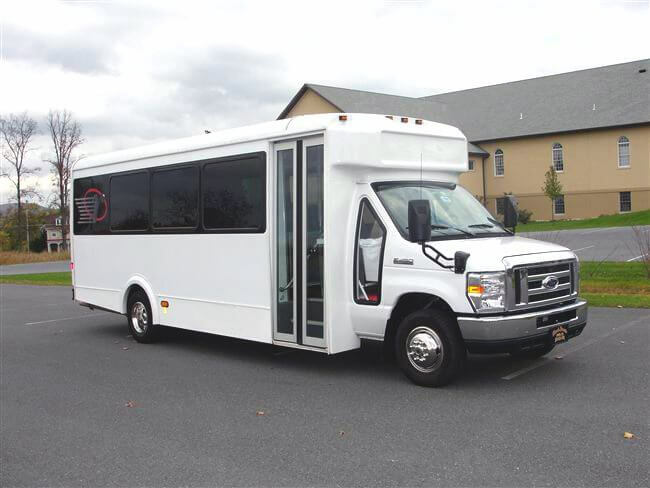 We have vehicles in all shapes and sizes ranging from small minibuses and Sprinter buses to large 56 passenger charter buses. 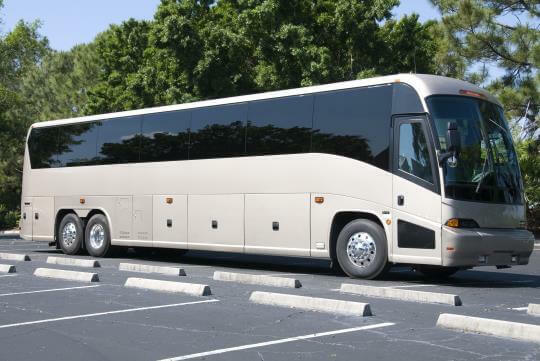 When you rent a charter bus in Florida you can tour all of the sights you and your group wish to visit. 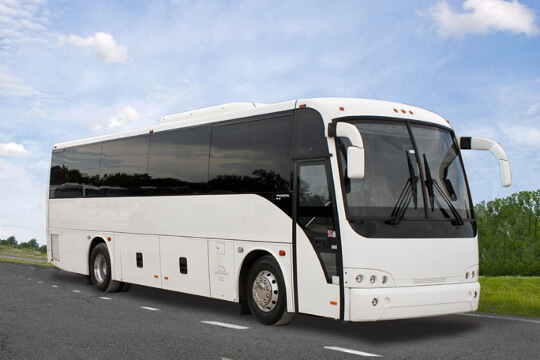 Whether you want to catch a sports game at one of the many arenas throughout the state or a bite to eat on the way to a convention you can do it all with a bus rental. Miami - This southernmost metropolis has so much to offer. South Beach offers plenty of opportunity to party, live it up and enjoy the beach. Plenty of opportunities for shopping and cuisine can be found throughout Miami as well as nightclubs and entertainment venues. If sports is your thing you can catch a Miami Heat game at the American Airlines Arena or a Miami Dolphins football game at Hard Rock Stadium. 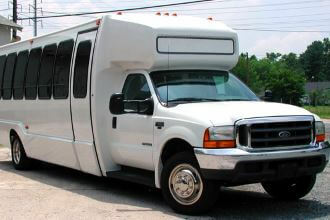 Whatever your plans are a charter bus from Price4Limo can provide the means to get you into and around Miami safely. Orlando - Located in central Florida this city is most known for it's resident theme parks. Disneyworld encompases multiple parks that offer amazing experiences including Magic Kingdom, Epcot, Disney's Hollywood Studios, and Animal Kingdom. There is also Universal Studios which is home to the best thrill rides in the state. Orlando has plenty of opportunity for entertainment and fun aside from theme parks. Downtown is bustling with plenty of nightlife. With so much to do in one city it's no wonder Orlando is one of Price4Limo's most popular cities to travel to. Tampa - This city has excellent beaches on the Gulf coast, multiple sporting venues for teams like the Buccaneers and Rays, and the theme park Busch Gardens. You'll find plenty to do here while you're in town! If you're looking for clubs, entertainment and other nightlife then Ybor City should be your primary destination here. 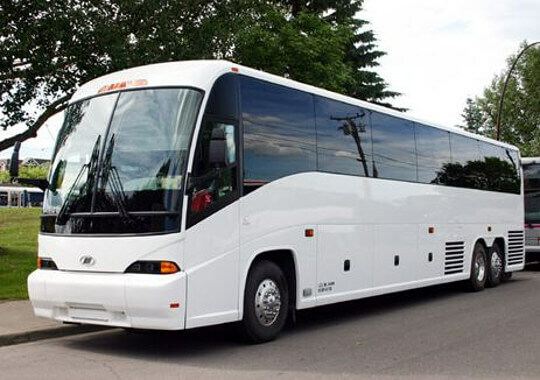 Making your way to Tampa is easy when you have a bus rental from Price4Limo. Want to visit other cities in Florida? 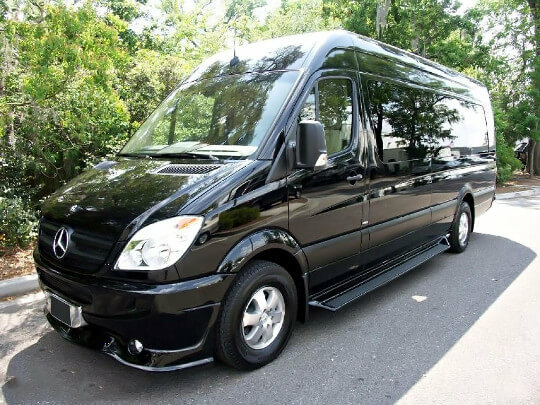 Price4Limo has charter buses and minibuses that can take you wherever you want to go including cities like Fort Lauderdale, Fort Myers, Key West, Jacksonville, Tallahassee and St. Augustine. Our representatives are here to help you plan your trip either by phone or online. Florida has so much to offer that it can be difficult to decide what to visit the state for. Do you want to visit awesome theme parks with your family and friends? Are beaches and relaxation something you desire? There's a lot of things to do in the state but we'll cover the basics to give you an idea. One of the reasons Florida is such a popular tourist destination are it's multiple theme parks. Central Florida plays host to most of them which include Disneyworld and all it's subsidiary parks, Universal Studios, Seaworld and Busch Gardens in Tampa. They're the perfect desination for families and groups of friends to have a fun and memorable time. There are countless clubs and bars dotted throughout Florida. Miami and Fort Lauderdale have many opulent nightclubs and concert venues to see your favorite band or artist. Orlando, Tampa, Jacksonville and other larger cities offer plenty of places to party or see a concert as well. You can find some kind of museum or theater in nearly every major city in Florida. See a play at the Adrienne Arsht Center for the Performing Arts in Miami. Visit the Salvador Dalí Museum in St. Petersburg near Tampa and see the artist's surrealist works in person. See the collection of priceless art at the Pérez Art Museum Miami. There's something for everyone in Florida when it comes to food. Whether you're looking for a high class dining experience or an award winning hole-in-the-wall style diner you're sure to find something delicious. Shopping opportunities are abound no matter where you go in the state. You can find lots of unique boutiques as well as large shopping malls and outlet stores. Florida plays host to many different professional sports teams primarily in Miami, Orlando, Tampa and Jacksonville. Daytona Beach is home to the Daytona 500, a huge event for NASCAR. Many MLB teams play their Spring Training games down here as well. The state also offers over 1,200 gold courses which is more than any other state! St. Augustine is one of the oldest settlements in not only Florida but the entire country. It's rich with historial places including museums and the Spanish fortress Castillo de San Marcos. Key West has the Ernest Hemmingway House, the old fort at Dry Tortugas National Park, and the southern-most point in the US. All year round you can enjoy Florida's majestic beaches, making it a very popular desination for northeners. The white sandy beaches and warm waters offer plenty of activies to do like sunbathing, surfing, swimming and fishing. There are many sunken ships and coral reefs off the coast that scuba divers can explore. You'll also find Florida has many national parks including the massive Everglades National Park. Florida is home to numerous zoos and aquariums. Zoo Miami is regarded as one of the best in the country. Other notable zoos include the Jacksonville Zoo and the Lowry Park Zoo in Tampa. The Florida Aquarium in Tampa and the Miami Seaquarium are some of the more well known ones in the state. Other than what's been listed here there are a lot of other interesting activities you can do. Go on a ghost tour in St. Augustine or at the Riddle House in West Palm Beach. Pick some fresh oranges at one of the many orange groves Florida is known for. Go fishing in one of the many lakes and rivers or even go salt-water fishing in the ocean. Do some searching and you'll never know what kind of adventure you'll find in the Sunshine State! 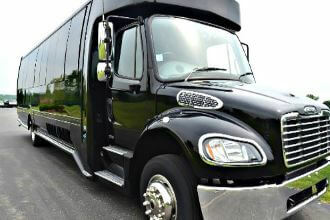 Getting a quote or pricing for a charter bus is easy with Price4Limo! Our expert customer service representatives are very knowledgable and can help you find the perfect transportation for your special event. Give us a call today at 855-458-7002 or fill out the form below for free quotes on multiple vehicles in your area.